A pretty pout starts with these personalized lip balm party favors…mwah! Surprise your guests with something they'll love at your event by handing out personalized lip balms. These cute and customizable gifts for guests are ideal for just about any kind of event. And because everyone can use lip balm, it's a practical gift they'll appreciate well after the party is over. 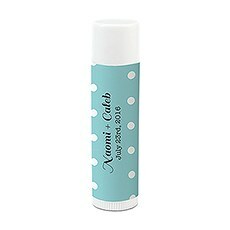 At Weddingstar, we offer a great selection of personalized lip balms for party guests. 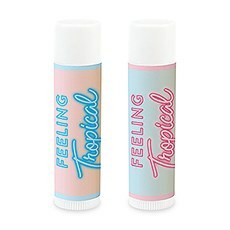 Use these to make your wedding or other special event even more memorable.All in the DetailsOne of the best parts about shopping for custom lip balms at Weddingstar is getting to pick out the design and custom details. We offer a variety of stylish lip balm wrappers from which to choose, making it easy to coordinate your favor selection with the look and feel of the event. For example, you can go with a lip balm design that's more elegant and classic or one that's colorful and charming. Either way, your guests will love this fun little token of appreciation. Plus, you can add your own personal details to the gift to make it even more special. Include a note to guests, the names of the happy couple or the event date to really make your mark with this distinctive party favor.Practical PurposesLip balm makes for a great gift because it's something that can be used by people of all ages. In addition, it's something you can never have too much of. In fact, your guests may even use your lip balm on the day of the event. That extra gesture of giving back to your guests is something that truly makes you stand out as a stellar host. Be sure to show your guests a little extra love at your next celebration by giving them personalized lip balm from Weddingstar.